In this piece from Mountaineer Magazine, meet Wendell Brown and Roberta Spiro - they met in 1980 and were engaged just 4 months later on the Seattle waterfront. They celebrated their 37th wedding anniversary on Valentine's Day 2018. In each issue of Mountaineer magazine, we feature two lovebirds who met through The Mountaineers and share a passion of the outdoors. In this column, we talked to Wendel Brown & Roberta Spiro, who met in 1980 and recently celebrated their 37th wedding anniversary. Wendell: We each signed up for a singles hike to Palisades Lakes. We chatted in the parking lot and continued to talk through the entire hike. We didn't even try to talk to anyone else! That night we met in Seattle for our first date. Wendell: I thought Roberta was very smart and good looking. The hike went downhill to the lake, so we could talk without being breathless, and by the time we started walking up the hill, we knew we liked each other. We decided to get together that night, and Roberta suggested we go see the ballet Swan Lake. The following weekend we went on a car camping trip in the Olympic Peninsula for our second date. Roberta: I liked how comfortable he was in the outdoors. I was impressed that he cooked tacos for me over the camp stove! I felt very safe in the wilderness with him. We saw each other a lot from the first weekend in August until mid-December. Then one midweek night he came over and suggested we take a walk on the Seattle waterfront. That's where he proposed. Although we only knew each other for 4 months, I didn't hesitate to say, "Yes!" We got married on Valentine’s Day two months later, and have been together ever since. Wendell: On our second date car camping on the Olympic Peninsula, a deer walked right though our camp. It must have been a good omen, since we got married six months later. What’s your favorite outdoor memory together? Roberta: Hiking, mountain biking, and cross country skiing have been an important part of our relationship, even after we had children. When I was still pregnant with our first child, we bought a tiny pair of cross-country skis for him! We often took our two children camping when they were young. Roberta: We’re proud that our love of the outdoors was passed on to our two sons. One son lives in the Lake Tahoe area so he can take advantage of the fabulous outdoor recreational opportunities there. The other son is a documentary film producer who helped produce two films that deal with the outdoors: "Dirtbag: The Legend of Fred Beckey" and "K2: Siren of the Himalayas." Now we look forward to sharing the outdoors with our first grandchild who is 18 months old! Do you have a favorite piece(s) of outdoor gear that has been pivotal in your relationship happiness? 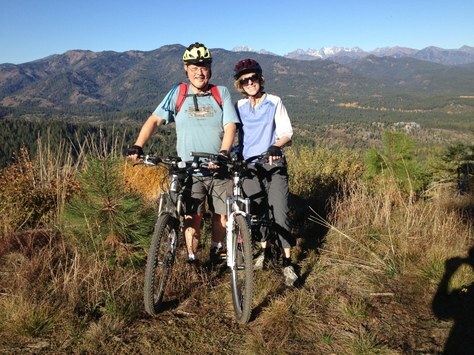 Wendell: Cross-country skis and mountain bikes have allowed us to continue exploring the beautiful outdoors together, even as we slow down a bit with age. In 2012, exactly one year after Roberta had her heart valve repair surgery, we celebrated her recovery by skiing up and down Mazama Ridge near Paradise. If you know a couple that met through The Mountaineers, email Kristina Ciari, Mountaineers Communications Director, at kristinac@mountaineers.org.